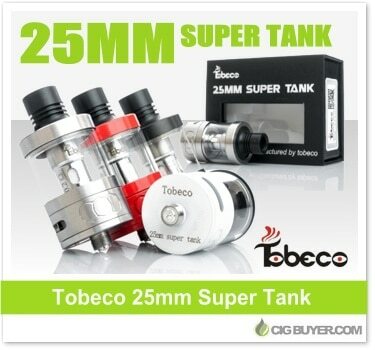 The Tobeco 25mm Super Tank is the largest of the Super Tank line, offering 25% more capacity (5ml) while measuring the same height as the Super Tank Mini. This high quality sub-ohm tank comes with an affordable price tag and features a unique top fill design (just unscrew the delrin drip tip to expose the fill ports) with dual adjustable airflow slots on the base. Made from quality stainless steel and glass, the 25mm Super Tank comes with two vertical coils (0.2 and a 0.5 ohm) rated up to 100W, and other Super Tank coils are sold separately.